Although I’ve started to buy in lettuces from my local greengrocer, this mild weather has meant that I still have a fair few herbs and autumn leaves in the garden which greatly improve the flavour (and texture) of otherwise rather dull salads. I’m amazed that I have quite a number of flowers on some late self-seeded Borage plants, sitting atop what is left of my autumn ‘Solix’ lettuces (normally frosted and over by now). Next are some fiery mustard leaves (because I didn’t get around to sowing a late batch of the more gentle ‘Green in Snow’) resting on top of my Sugar Loaf Chicory. I really love this Chicory leaf. It’s the only truly winter leaf I’ve grown this year and it’s the softness of the leaf I appreciate, as well as the gentle bitter taste. It contrasts well with the crispness and sweetness of bought Cos lettuces and both combine well with a punchy vinaigrette. I’ve covered up some plants with fleece whilst others are without protection against the elements, and the only difference that I’ve noticed so far is that the covered ones have more tiny black slugs in/on them, so extra caution is needed when washing! Just below are some nasturtium leaves, nice and peppery and to the right of these is some Salad Burnet, supplying a very subtle cucumber flavour. At 6 o’clock are the remains of my Buckler Leaf Sorrel, deliciously lemony with a succulent bite, and finally there’s the last few pickings of Sweet Cicely. I feel like weeping that I’ll be deprived of this gentle aniseed flavour (and feathery texture) soon and for the next two or three months, as a small amount of this wonderful perennial herb can really transform a salad from bland to positively tasty. 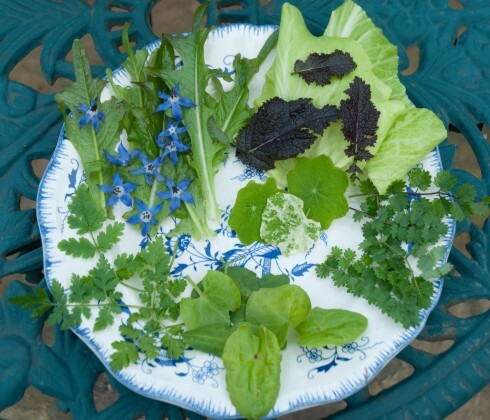 I know that as soon as some colder weather appears, most of these leaves will vanish, but I’m cherishing these sumptuous, tangy salad leaves (and flowers) for as long as they last. Now that looks a most attractive smörgåsbord of green goodness to nibble from Naomi. Amazed to see that you still have nasturtium leaves – long turned to slime here. A shame that your Sweet Cicely has gone into hibernation but you will appreciate it offerings all the more on its return 🙂 Maybe in the meantime you could sprinkle some seeds on your salads for the aniseed effect. Hi Anna, Thanks for that great suggestion. It’s just been so lovely to be able to keep on harvesting the Sweet Cicely, that I hate to see it all die away…Definitely induces winter gloomy feelings. Hi SFS, you rocket does indeed look spelndid! Think I may sow a few seeds now too in my mini greenhouse and see what happens! What a brilliant selection of salad leaves you have for January. Amazing that you still have nasturtium leaves and borage flowers. I can’t believe the lush new growth on my chard and parsley though (am adding baby chard & cavolo nero leaves along with parsley to my chicory in salads). Am also picking and eating them as much as possible assuming the mild weather can’t possible last. Hi Andrea, once these late leaves are over, I’ll be picking my Cavolo nero too, but just wish I’d sown more last year! Can always eat heaps of the stuff! Hi Michelle, yes we’ve had some lovely salads (up ’til now!) but sad most will be coming to an end soonish… Must dot a few more sorrel plants around the garden for more late pickings next year. Fab. I still have nasturtium leaves too. Inspired to consume them. Hi Nicolette, always a lovely addition to a salad! It’s so satisfying at this time of year getting greens for free as it were. I had nasturtium leaves until a week ago when a sharp frost took them out but hope to find rocket when I venture to the allotment tomorrow. That is amazing for January. How lovely it looks too. Hi Dorris, You’re right! All these leaves do add a certain gorgeousness to the salad bowl as well as tasting great! This mild weather has been a blessing so far with unexpected crops hanging on. I’m wondering will a cold spell ever hit? But then maybe that’s just being optimistic! Hi Samuel, I was wondering the same yesterday as I planted a good few hundred daffodils (very late I know-post to follow). Only had a couple of hard frosts so far, but still plenty of time for a bit of snow hopefully. P.s. Good luck with your new garden! I sympathise with your dilemma, Naomi as I’m buying in so much bagged salad at the moment that I”m seriously considering turning the whole garden over to edible flowers and salad leaves! (Realistically, though, there always has to be room for beetroot.) Both my Sweet Cicely plants have keeled over now, such a pity as they were looking lush with young leaves a week ago. Interesting that the slugs are finding your covered leaves – I’m going to try higher raised beds for salad leaves this year to see if that proves more of a challenge for them! Hi Caro, yes, I’m definitely a believer in growing what you love to eat -and lots of it. We eat so many salads, that herbs and lettuces are the best use of our small growing space, plus autumn raspberries and japanese wineberries for the luxury of picking fresh berries (and for being so easy to grow!). Can’t be without sweet peas in summer either and love the odd Dahlia too and then it’s a matter of squeezing in whatever other plants will fit in from my wish list. Buckler Leaf Sorrel sounds rather wonderful, I think I may have to add that to my list. I completely forgot nasturtium leaves were tasty as well as flowers – duh – really must see if the last bedraggled specimens still hold any flavour. Hi Janet, yes both types of Sorrel have been a (delicious) revelation this year. Have absolutely loved adding leaves to salads, but I plan on growing more this year so I can experiment with soups too.